I’m remembering a scene in the first act of a performance of Thornton Wilder’s brilliant play By the Skin of Our Teeth at the Young Vic, when the maid tried to exit the stage, but the door was jammed. As she pulled at the handle and rattled the recalcitrant door, the stage set shook and books tumbled off the adjoining shelves. Although we did not know it at the time, this seeming stage accident was part of the plot design, symbolising that the characters were locked within the structural confines of the classic three act play, effectively unable to escape. Bound by convention and structure, the author sends his protagonists spinning through history, drops props on them, interrupts the action, removes the actors from their characters, but the play must go on and be completed. In a similar sense we were locked for a period into the origins of our company history and became hostage to the name we had given ourselves. Although we flew out of the pigeonhole many years ago, there are still people who believe that we only sell wines from South West France and refuse even to entertain the thought that our buyers may have strayed wittingly outside our Gascon heritage. Unlike Thornton Wilder’s doomed creations, however, we can write our own history and kick down the door of expectation. Inventing an identity is not about chasing trends. You have to believe in something – be it in the farmers who make the wine, the notion of organic husbandry, the concept of terroir and authenticity, or simply love the culture of a particular region or place, and feel a bounden desire to represent it by promulgating the virtues of its wines. We started with virtually nothing, a handful of wines and growers, no brands, no crowd-pleasers and no regal wines, for we believed that (in wine terms) “kind hearts are more than coronets/And simple faith than Norman blood”, which brings us by a commodius vicus of recirculation to our Ascoyne Gascoyne roots. Inventing an identity is not about chasing trends. You have to believe in something. So, Les Caves de Pyrène, and its concomitant mispronunciations, was our second attempt to forge a nominal identity. 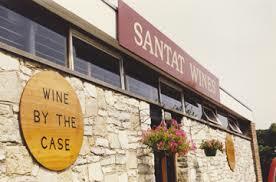 The original name of the company was Santat, an Occitan version of the word santé. The exclamation mark was silent. 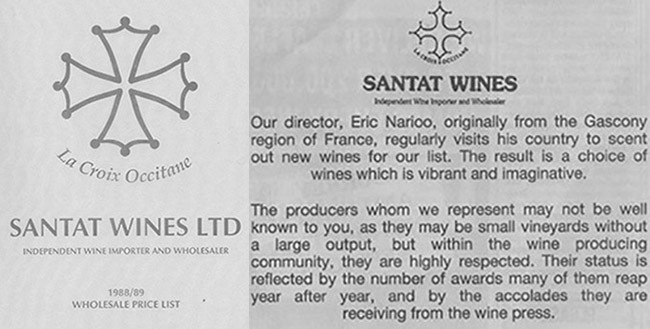 Santat wine list from 1988/89. What’s in an accented name? Be it Pyrène or Pyrènées or any other variation thereof, a name begins as an empty vessel and gradually acquires an identity to go with it. The name was redolent of a region – the Pyrenees – and there were also deeper mythical resonances to mine. According to one Silius Italicus, Pyrene was the virginal daughter of Bebryx (good Scrabble score), a Gallic king who showed hospitality to Hercules whilst he was engaged in one his labours (stealing the cattle of Geryon). Hercules, characteristically drunk and lustful, violated the code of hospitality and raped his host’s daughter. Afraid that her father would be angry, Pyrene ran away to the woods, and poured out her story to the trees, attracting the attention instead of wild beasts who tore her to pieces. Another story is that she bore a serpent, fled to the woods and died there. After his victory over Geryon, Hercules passed through the kingdom of Bebryx again, and discovering Pyrene’s dismembered body, was heartbroken. In remorse at the actions of his darker self he laid Pyrene to rest, demanding that the very mountains join in mourning and preserve her name in perpetuity: “Struck by the Herculean voice, the mountaintops shudder at the ridges; he kept crying out with a sorrowful noise ‘Pyrene!’ and all the rock-cliffs and wild-beast haunts echo back ‘Pyrene!’ … The mountains hold on to the wept-over name through the ages.” In other versions Pyrene, banished for shame by her father, is torn apart by a bear (we will return to bears again), and Hercules, beside himself with grief, picked up a handful of rocks and hurled them into a pile to create a tomb for her. Those rocks are the Pyrenees. Myths and images. The myth of the wild grief of a Greek demi-god. The image of a mighty and mysterious mountain range honeycombed with caves linking the Atlantic to the Mediterranean. We established roots on the back of such rocky apocrypha and romantic illusions. But the wines were real enough, as were the people who made them, and there was no doubting the glorious gastronomic heritage of the region. Pyrenees, Gascony, South West corner…we used the terms interchangeably to familiarise customers with this relatively unknown part of the wine world. The wines, despite their lengthy history, were not talked about, certainly not critically extolled. Cahors, for example, a region planted with vines around 50 BC and whose wines enjoyed great notoriety in the Middle Ages, loved by Tsar Peter The Great, and promoted by Pope John XXII (a Cahors man through and through) was still caricatured as The Black Wine, a reference to an ancient method of boiling the must to tannic oblivion; Jurançon, the holy wine rubbed on the lips of the Henry IV himself in a baptismal act, if one actually possessed the courage to assay its pronunciation in a restaurant, was generally rhymed with King Kong, and if you spluttered Pacherenc-du-Vic-Bilh in polite company, it usually resulted in someone saying “bless you!”. Nor were there many cynosures or compelling personalities to carry these appellations to greater recognition. Co-ops dominated the production, with most growers in these regions selling their grapes, and therefore not interested in progressive quality-driven organic farming techniques. The wines, despite their lengthy history, were not talked about, certainly not critically extolled. Nevertheless, Eric was bred into the wine culture of Gascony and this fact informed our prelapsarian wine lists into which were insinuated no fewer than seven Madirans, six Jurançons and numerous examples of Cahors. A lot of Cot. And not a lot else, frankly. And why not? All our early tastings thus revolved around the growers and the gastronomy of the South West. In the mid-1990s, vignerons from that region had begun to take note of what was happening in nearby Bordeaux and adopted certain flashy oenological techniques to give their wines more polish and apparent substance. Under the banner Vins du Sud-Ouest progressive growers from various Gascon appellations, under the auspices of writer and journalist Pierre Casamayor, formed a group in order to exchange ideas about winemaking. The notion of Les Barriques Neuves (their other sobriquet) is something that we find immeasurably less appealing now, but in those naive days, the idea of breast-beating, plushly-upholstered, purple-hued wine seemed intoxicating. The SW section of our current wine list is riddled with then-and-now sentiments. Whereas the preface to the Gascon section cites Victor Hugo’s romantic epigram that La symetrie, c’est l’ennui, we may still find jolly-hockey-sticks paeons to squareness like “Big can be beautiful though, especially if you enjoy tannin on your tusks,” and approving descriptions such as “lees in your lungs”; “contrast the jaw-dropping Escausses Vigne de l’Oubli – another “semi” Sauvignon in the Moulin des Dames bracket (lots of lees contact, new oak, thick with flavour – we second that emulsion! )”; “Godzillas of Gascony”, or the laudatory sentiment that “certain wines [could eat] Saint-Emilions for breakfast”. Controlled power was tantamount to the assertion of singular identity; rusticity measured in rich opacity. I know – I can’t believe it either. Over the years, our palates and our philosophy changed. Less became more, transparency and lightness were the real virtues, fluidity and tension were desired, whereas the extraction we once cleaved to, came to be seen as a vulgar manipulation. Yes, in those days, we wanted to have our Gateau Basque and devour it greedily. On the one hand, we wanted lacquered wines to out-Bordeaux Bordeaux, whilst at the same time poking fun at a region as the fuddy-duddy bourgeois too-wealthy-for-its-own-good-relative. We wanted to represent the anti-establishment, to infiltrate the wine scene with Gascon mutineers that bristled and bridled with élan and panache. Supporting the underdog was inevitably emblematic of the cavalier Gascon approach, when the future of the company stretched as far as…the next day. The Hitchhiker’s Guide to the Galaxy has one piece of very sage advice when trying to navigate the Les Caves de Pyrène wine catalogue: Don’t Panic! The Bergerac and the Bordeaux tribute bands may be a long way from the Pyrenees, but then the south west is a pretty amorphous area in wine terms. Not that our journey is geographical, hopping from neighbour to neighbour, nor does it observe the confines of appellation, rather it centres on key moments in time, myriad epiphanies and realisations that have sparked our continuous wine education. Once upon a time, o best beloved, we had a penchant for fanty-sheeny architectural wines. Lush wines. Lees are the building blocks of wine and we enjoyed the most serious examples of animated batonnage. In white wines their incorporation might be appreciated as a thick emulsion (that word again) of gingery-cumin-spiced briochey-ness. Wines as “layer cakes”. Red wines would opaque and unfiltered, glossy with purple-tinctured fruit. We loved, for instance, the idea that a particular vintage Moulin des Dames Rouge from Chateau Tour des Gendres in Bergerac had trounced Chateau Margaux in a blind tasting. Wine relativity fascinated us – benchmarking, Parkerisation, Platonic notions of quality provided a compelling narrative for selling wine. The darker it was, the deeper the wine became. What did you write for your tasting note? More like black as japanned box. Is that all? I wrote that it was as black as the mouth of a black hole where all the light and mass had been squeezed out. I’m sorry- which wine were we talking about? Luc de Conti, of Chateau Tour des Gendres, was our self-styled Monsieur Mayonnaise, a masked vinarchiste (more self-styling), the superhero of lees-emulsion. Luc sought purity and intensity in spades, the maximum expression of the potential of the grapes, and to this end, adopted both traditional and modern practices. He nourished his vineyard soils with seaweed and silica treatments to encourage microbial activity, for, according to him, the soil was lifeless (“a cadaver”) and it would be a painstaking fifteen-year process to wholly rid the ground of pollutants. To make great wines, manual picking and selection of fully-mature grapes was essential; on the top cuvées there would several tries through the vineyard, with the wine only released if it met his exacting standards. This perfectionist vigneron even claimed to riddle the grapes on the vine, giving them a quarter turn (at least that’s what he told us – difficult to know when you’ve been hoaxed by Luc). Since here was a man who would not scruple to hide a truffle for his dog to nose out just to impress you. If you would riddle a grape, then surely making a mayonnaise was no big thing. Luc’s Cuvée des Conti was my first inexpensive white wine epiphany. 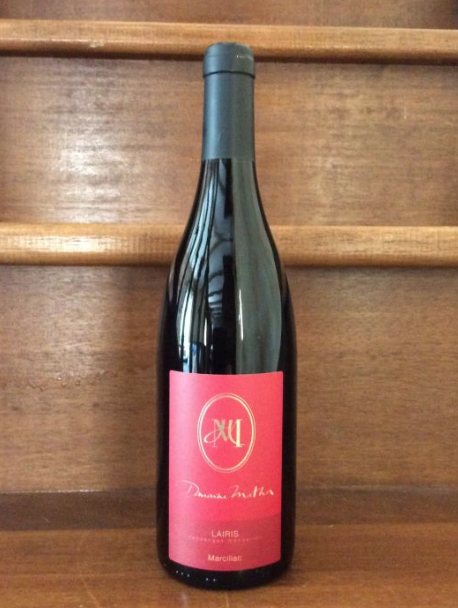 Then there was the more expensive Moulin des Dames. And then the most expensive Moulin des Dames Anthologia. I waxed lyrical to the point of histrionics. The cuvée! The cuvée above the cuvée!! The cuvée above the cuvée above the cuvée!!! Over the years, our palates and our philosophy changed. Less became more, transparency and lightness were the real virtues, fluidity and tension were desired, whereas the extraction we once cleaved to, came to be seen as a vulgar manipulation. “Some wines yield so much that they demand the deepest absorption from the taster. The Anthologia Blanc from Luc de Conti is for me one such. I poured a glass: its colour was striking, a definitive old gold that seemed to trap the light in its embrace. This peach-hued song of sunset with resonant nose-honeying warmth was truly the ‘yeast of Eden’. If the colour drew me in, then the nose conjured a riot of sensuous (and sensual) images. One breathes in tropical aromas of candied apple, coconut, plump peach and honeydew vying with exotic Indian spice – there’s cumin, fenugreek and dried ginger … and as the wine warms and develops after each swirl in the glass the leesy butteriness which reined in the rampant fruit dissolves and one is left with sweet balm tempered by the most wonderful natural fresh fruit acidity. Experiencing the Anthologia for the first time was an epiphany for me, like the beauty of a sunset ‘…the time between the lights when colours undergo their intensification and purples and gold burn in the window panes like the beat of an excitable heart…when the beauty of the world which is soon to perish, has two edges, one of laughter, one of anguish’. Or like summer arriving after a harsh spring, when the clouds fold back, like the ravelling up of a screen, as Adam Nicholson put it. This was not Vin Blanc but Vin d’Or. Certainly not Piat d’Or. Everyone has their special wine moment and their own private language to describe it. Ok, ok. How embarrassing! But important to ‘fess up to one’s hyperbolic vapours. It was a time when everything had to be a pluperfect taste sensation, when we rolled over onto our backs to have our tummies ticked by impressiveness. For a small company the biggest of wines were the best of wines and the best of times, and allowed one to enter the ring of heavyweights. Yet, not everything in our little world before natural wines was pure oak and emulsion-recollected-in-tranquillity. The earthy reds of Marcillac and the Aveyron, for example, for which the epithet “sanguine” might have been coined, rated five padded-pages in our wine list, having spawned several positively magical mystery tour digressions. Two Marcillacs?! Indeed. As Lady Bracknell might have animadverted: “To have acquired one Marcillac may be regarded as good fortune; to have acquired two looks like careless obsession”. We sought to claim the moral high ground of terroir by cornering every last wine that exhibited typicity in a small region. The smaller the region was the more we assiduously combed it for wine nuggets. Being magnificently obscure gave us a Buddhistic serenity. Or a kind of spurious one-upmanship. Of all the south western regions Marcillac was the one that yodelled terroir at the top of its lungs. In fact, it transcended its rustic origins and became a metaphor for a style of global “iron-filing” licksome red wine that we adored. “The Marcillac of…” was always a call to wine-buying arms. The only appellation in the Aveyron region to enjoy AOC status, it lies on the Aveyron river just north west of Rodez, and is linked historically to the Abbey of Conques. To the north lie the barren plateaux called les causses. This is wild mountainous country, gutted with deep river gorges. For nearly a thousand years, vineyards were the base of the region’s economy. In 1868 phylloxera destroyed the vineyards by ninety percent. The economy was devastated and many natives of the region moved away. The style or philosophy of the wines is connected to the area and the grape variety. The vineyards are grown on terraces with very steep gradients; the soil is the reddish-purple le rougier with a schist underlay; the grape variety is mansois, otherwise known as fer servadou; only old barrels and traditional methods are used. Only a tiny handful of growers to this day farm these remote terroirs and make wines for commercial sale. The smaller the region was the more we assiduously combed it for wine nuggets. Being magnificently obscure gave us a Buddhistic serenity. Or a kind of spurious one-upmanship. Defining the notion of gouleyant or gracia placendi, Marcillacs are so instantly appealing that we want to unfurl our tongues and allow the flavours to prickle across our palates without analysis. Violet-tinted, brilliant fresh reds packed with fresh currant fruits, provocative acidity and a medicinal minerality, they are the vinous equivalent of Chalybeate water. The medieval citizens of Rodez used to take Marcillac for their health, because it was preferable to drinking the local water. One Pascal Monestier, the son of a pharmacist in Marcillac, in a thesis on the prevention of cholesterol by the consumption of wine, discovered especially high concentrations of cathecine and procyamidol – anti-cholesterol agents – in the wines. As the bible says, “Take a little wine for thy stomach”! And, as they also say in the South-West, one does not live by how one eats, but by how one digests. And what might be we digesting? Confit de canard, oxtail with carrots or a traditional pot au feu are choice partners. Wine does not have to be pretentious to be interesting; when we drink Marcillac we realise that simplicity is an under-rated virtue. Thinking about this embodiment of the Marcillac valley (Jean-Luc has worked the land for over thirty-five years now), I envisioned what peasants drank. Something simple, pared back, elemental even. Russet yeas and honest kersey noes wines, quaffed in litres by horny-handed sons of the sod. “I am not fond, for everyday at least, of racy, heady wines that diffuse a potent charm and have their own particular flavour. What I like best is a clean, light, modest country vintage of no special name. One can carry plenty of it and it has a good and homely flavour of the land, and of the earth and sky and woods”. Steppenwolf. Yes, that was it, vino veritas. Is there a point in getting the wine? Understanding something is necessarily constrained by the very limited linguistic frameworks within which we operate. I do a lot of tutored tastings and I realise that although we may all use the same words in describing a wine we may mean quite different things by them. Language is an impure form of description: in tasting notes we use ten words where one will do and we never get close to the heart of the wine. We can anatomise every single detail and pile up the adjectives, but the words are just echoes of the emotions we feel when we taste the wine. If the wine moves us at all. If you listen to classical music do you appreciate it more by pulling it apart intellectually, or do you allow yourself to be swept up in the flow and feel it on the pulses? The time I “get” the wine (or the picture, or the poem, or the music) is when I am least critical, least straining after meaning, then I don’t “get the wine” – it “gets me”. The wine in the glass is only one stage in a complex transformative process. The so-called objective transformations are the result of what happens to the grapes in the vineyard and in the winery. But the final transformation is the response to tasting the wine itself and where that experience takes the individual taster. It is difficult to share these responses, as I’ve mentioned, because language is an insufficiently sensitive instrument. One’s descriptive powers completely desert him and the tasting note collapses in on itself. Tasting doesn’t just involve the usual “perceptive” senses; our sense of excitement, our sense of pleasure and our sense of imagination brings the wine ineluctably to life. 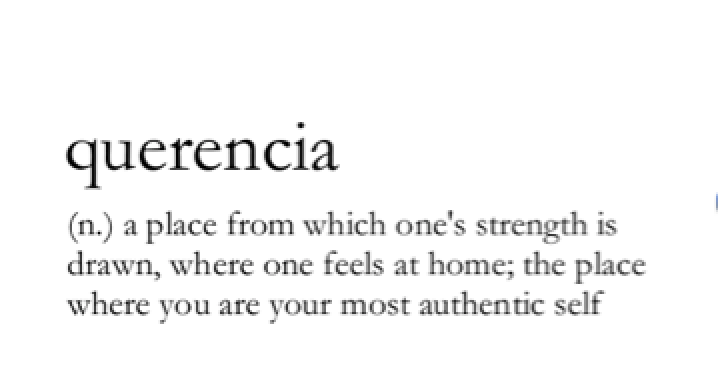 And that’s something worth getting. Back on terra firma, points are the means whereby we codify “getting the wine”. The usual register is 100, although it effectively operates at 80 and above according to some, or 50 and above according to others. Who establishes the criteria for marking and is the scale remotely meaningful? Is there a received wisdom concerning wine that we can deconstruct the various components that make it up and assess clearly and conscientiously the real value of what we are drinking? Critical approbation tends to focus on the lavishly made up wines: primped, pumped, souped-up models. I don’t “get” these wines any more than I get an expensive fake fur coat. My experience of wine competitions is that in a line-up of multiple wines of various styles the nuances are discarded in favour of the broad brushstrokes. The wines of Marcillac remind us that less is more. Disagreement is an important part of debate. The way I taste is who I am and what I like. Consequently, there are wines that I find faulty because I dislike them. For example, any wine which tastes acidified or alcoholic or sweetly toasted, wherein I can taste the interventions at the expense of the fruit and essential flavour is, to my palate, faulty. I can’t imagine the winemaker admitting the fault – which becomes a neat paradox: the desire to avoid faults in the wine is so great that it drives the winemaker into making meretricious, over-elaborated wines. The desire to improve on nature and keeping on adding layers of flavour is the desire to conform to a perceived archetype of what is good. The winemakers themselves are guilty in coaxing the wine fit the recipe. The wines of Marcillac remind us that less is more. As Eric is wont to ask: “Which is the wine that you would take home and drink”? The gutsy wines of Aveyron and Gaillac are a million miles away from the international-style cuvées lying inertly in their oak coffins surrounded by their trove of competition medals. The former gets the juices flowing; the others clog our arteries. Wine does not have to be pretentious to be interesting; when we drink Marcillac we realise that simplicity is an under-rated virtue. If there was ever to be a movie of Get Marcillac I nominate Jean-Luc Matha for the Michael Caine Jack Carter role. Aka Fer, Mansois and Pinenc for grape synonym-hankerers, and long-time Caves de Pyrene favourite. 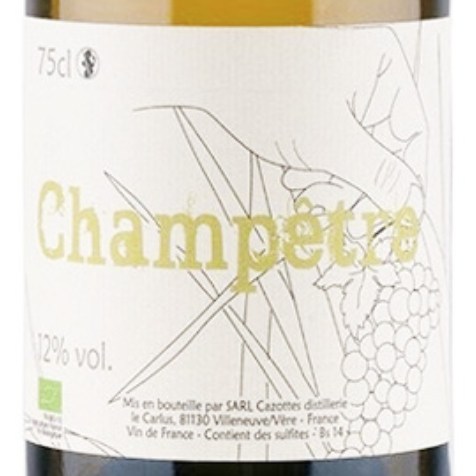 Growers dabbling with this grape are the Marcillac Mansois-ers, Philippe Teulier and Jean-Luc Matha; Nicolas Carmarans who deals in the fer trade in Aveyron, the Plageoles family who make the winningly-named Bro’cool, and Laurent Cazottes with Champetre Rouge, all rustic simplicity. Difficult not to love unreservedly this sprightly bobbish cherry-red grape which is lithe and sharp and as pure as a nun who’s into serious fun. Slim and wiry wine, the tartness carrying some lovely earthy-slatey fruit and wild spices on board, zipping the light fantastic. The Braucol wines capture the sanguine craggy goodness of the region. Talk about minerals! Shave some granite, grate some iron filings, crush those cherry stones…More purple than a self-indulgent, over-literate blog, Braucol has a freshness that eviscerates confit duck at ten paces, and sports scything natural acids that lend the fruit flavours their cheery-cherry after-bite. Some versions (old viners) age more than indecently and begin to resemble great Cabernet Franc in time. white knights guarding red queen. pet their crust, blushed as its wine. in alleyways that mid-day heat forgets. bleached oak doors and rusted hasps obey. where mantis pray and buzzards levitate. Nicolas (Nico) Carmarans, restaurateur and vigneron, a man who looks like he wrestles bears and then eats them for breakfast, has vines in planted on the decomposed granites high in the northern Aveyron. As he says himself “I want to make wines that I like to drink”. The Good Lord gave it to us! We’re in irony country, namely the gorges of gorgeous Aveyron. Nico has 3,3ha of vines planted in single row terraces on steep slopes. No wires, the vines grow on echalas the old-tradition way – wild like the countryside. He works on the slopes with a cable plough and sprayings (no weed killers or insecticides) are carried out manually. His Maximus is natural minimalism in a glass. Scarcely venturing above 11% it nevertheless sports brilliant purple raiment and positively billows with berry fruit. There is the usual graphite/slatey undertow and yeasty seasoning, but, like so many of Nico’s wines it is a lipsmacker. After destemming the grapes are fermented in tank. Delightful red fruit flavours abound amidst the sturdiness of the wine; raspberries and cherries on top of a layer of cool stones and pungent medicinality. It has a sanguine bobbersome quality that gets the pulses racing; it is good will amplified in a glass; it is the earth, water, grass and stones churned into a ruby-hued liquid; Keats’s beaker of the warm-with-a-mitigating-cool-microclimate-south! I can almost feel the cholesterol dissolving now. A word of advice though. In the vernacular parlance, don’t mull it, skull it! Before he was making delicious wild wines, Nico had a brasserie in Paris called Café de la Nouvelle Mairie. As part of our natural wine initiation we went there for a nosh and a slosh with Vincent Wallard. The joint was jumping but we managed to secure a table on the street, whilst Vincent went inside to parley with Nico. Vincent came back exhilarated and laden with bottles – Nico had allowed him to go into the cellar unaccompanied and choose some wines for our dinner. This, for him, was the equivalent of being given the keys to the holiest of holies. Emboldened by this carte blanche, he stopped by the table where Nico was enjoying his supper of sausages and lentils, and picked up a morsel of sausage from the plate. All hell ensued. Never come between a sanguine bistro owner and his dinner. Next post: Is Natural Wine Moral?